Digital Sight & Sound recently took an unofficial survey of clients that have automated gates at the end of their driveway or at their community entrance. We wanted to determine these clients’ levels of satisfaction with the gate services they were receiving, and, to our surprise, not even one was happy. My interest in automated gate systems was sparked when I was visiting a client whose lovely estate was protected by a beautiful wrought iron gate at the entrance of her long driveway. As I approached the gate from the road to enter the property, there was a keypad on a pedestal that was reminiscent of a 1972 payphone keypad. (Yes, this is a true story and happened in May 2017). “That’s complete bologna,” I said, and I was right. After months of searching for a better solution, Digital Sight & Sound is now providing advanced automated gate access systems. When your guest arrives and presses the button on the gate pedestal, it pushes a notification to your phone. 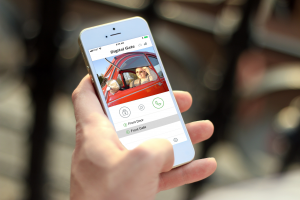 If you choose, you can then view, talk to and grant access to your guest right from the phone. The system is fully self-contained, with no need for phone lines or Internet access. In most cases, we can install the access control in just one day. Why settle for 1972? Call Digital Sight & Sound immediately for a free evaluation. Give us a call today at 317-848-0101 or visit us online at dssindy.com.